But maybe the video above inspired me to write again…who knows. But, I’m back…at least in some capacity, as I can’t guarantee daily updates or how often I will post, but I’m going to try to get back in the blogging groove, so, dear readers, thanks for stopping by and sticking around. 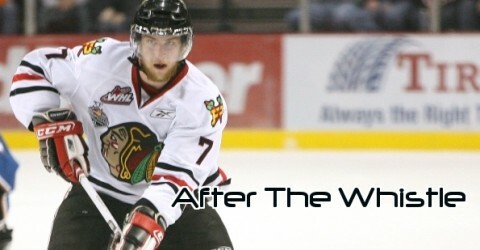 Here we are, the day before the 2012 WHL Playoffs start for the Portland Winterhawks. It seems like only days ago that we were filing into the Winterhawks Skating Center getting our first look at what would make up the 2011-12 Winterhawks coming off of the WHL Western Conference Championship last season. I knew then the Hawks would be a good hockey team, but I didn’t expect a 49 win, 102 point season. Not with all that the Hawks lost (some expected, some not) to the professional ranks. Losing two WHL star 19 year old players hurt, but it also opened the door for other players to step forward, and boy did they. Maybe in Portland we take it for granted, but it is hard to comprehend just how good of a season Ty Rattie and Sven Bartschi had in 2011-12. Rattie blasted through the 50 goal, 100 point mark as an 18 year old – something that is a major accomplishment. Rattie transformed his game from being a very good player to a dominant player in the span of a few months after being drafted by the St. Louis Blues. We all knew he was a special player, but even he would admit that a 121 point season wasn’t in his wildest dreams. Sven, well…I don’t know if a player has had a better 47 games in the WHL ever in a Winterhawks sweater. Marian Hossa had 85 points in 53 games in 1997-98. That may be as close to Sven’s numbers in the past 20 seasons. To average 2.00 points per game is incredible, but what I like most about Sven’s game is his willingness to initiate contact and do whatever it takes to win. He just wants the puck and won’t be stopped until he has it and the other team is fishing it out of the net. This team had depth and Mike Johnston added to that with some deadline deals and getting a bit of a gift when Oliver Gabriel returned from pro hockey in December. And all of that leads to where we are now…playoffs. This is what every team fights to get to after 72 games. The Hawks got very close to the ultimate major junior prize last season and the desire to not be denied that prize again is very prevalent in the locker room. The team has confidence in their ability. Some call it a swagger…and maybe they’re right. But I’d rather enter a room with a swagger than with my head bowed. It takes 16 wins to have the opportunity to play for the prize. But, you can’t get to 16 without winning the first one…and the chance for that comes tomorrow at the Veterans Memorial Coliseum against the Kelowna Rockets. I’ll save the analysis for the extended pre-game show tomorrow that can be heard at 6:20 at http://www.winterhawks.com and in the building on 96.5 FM. Win your shift, win the period, win the game and move on to the next. This team has had the mantra “championship habits” all season. Now is when the hard work gets rewarded. It’s good to have you back. Great insight on Bartschi. Do you think there’s any chance he makes it back here for the playoffs? Good to see you back, Andy. Isn’t that a line from “Shawshank”, oh well, doesn’t matter.